If you’ve ever used a Moleskine notebook, you know why people love them so much. Every inch of these products is carefully considered, and the end result is a durable notebook that’s a dream to write in! Yes, they’re more expensive than your standard spiral notebook, but the cost is worth it for a better writing experience. This Classic Soft Cover Notebook is 7.8" x 10" with rounded corners and an elastic closure. It comes in a variety of colors, and there’s a built-in ribbon bookmark to hold your place, as well as an expandable inner pocket on the back cover. The notebook opens at 180 degrees, so it will lie flat as you write, and you can even choose from ruled, dotted, or grid pages. Basically, it’s the perfect notebook for every purpose! Reviewers call this their “favorite notebook of all time,” explaining that it has a luxurious feel and wears well, even if you throw it in a backpack to carry around every day. People use it for writing, bullet journaling, sketching, and planning their schedules, and many say they will purchase this product again and again! If you're looking for a separate notebook to help manage your schedule, check out our guide to the best planners. Those who buy a lot of notebooks may be more concerned with saving money. 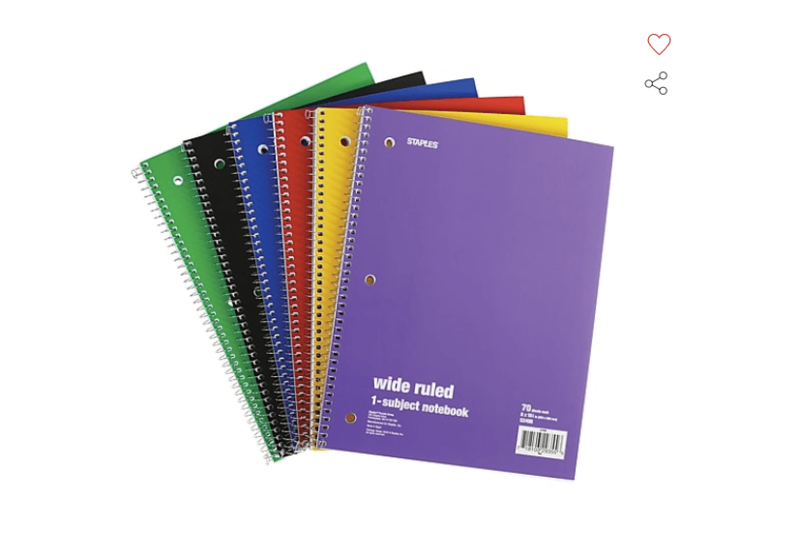 If you have numerous notebooks on your school supply list, one of your best options might be these Staples 1-Subject Notebooks, which are a great value for such a quality product. They come in packs of six, and you’ll get a rainbow of colors so each subject can have a separate shade. These notebooks measure 8" x 10.5" with 70 sheets in each. They include wide-ruled pages, which are great for younger kids, and they’re held together by a standard spiral spine. Plus, the notebooks include three-hole punches, so you can clip them into a binder if you want. Overall, the Staples 1-Subject Notebooks are a utilitarian choice for anyone who’s on a budget. Bullet journaling has spiked in popularity recently, and according to its creator, Ryder Carroll, it’s supposed to “help you track the past, organize the present, and plan for the future.” To get started, you'll need a special dotted notebook to create pretty, functional lists and schedules. There's no specific layout that you need to adopt, so you can experiment with different layouts and styles until you find one that works best for you. And the potential benefits are endless—track your habits, set goals, and achieve them. If you're ready to get started, you’ll need a canvas like the Dotted Grid Notebook. It comes in five fun colors and measures 5" x 8.5". There are 64 dotted sheets in the hard faux-leather cover, and it stays shut thanks to an elastic band. Additionally, the pages are designed to prevent bleeding, and there’s a pocket inside where you can store miscellaneous papers. Reviewers say this is an amazing option for a bullet journal, as you can color to your heart’s content without worrying about bleeding or transfer. Still can't decide on what you want? Our round-up of the best bullet journals can help you find what you're looking for. If you’re shopping for a good work notebook, you probably want something that’s affordable, professional, and portable. Luckily, you get all three of these characteristics with a 3-Pack of Field Notes Kraft Ruled Notebooks. These pocket-sized notebooks are a great value, and reviewers call them simple and effective. These notebooks are 3.5" x 5.5" and each one contains 48 ruled pages—though you can get them with blank or grid pages, as well. They’re made in the USA and fit perfectly in your pocket without seeming bulky. Reviewers say these notebooks are rugged and have high-quality paper, but a few do mention they wish the notebooks didn’t say “Field Notes” across the front. Beyond that, you couldn’t ask for a better work notebook. Whether you’re a freshman or a senior, chances are you’ll need a few notebooks to get you through your next year of college, and if you trust your peers, one of the best options is the Five Star Advance Spiral 5-Subject Notebook. Thanks to several unique features, this product will be your all-in-one college note-taking bible. This super-durable five-subject notebook measures 11" x 10" and has 200 college-ruled sheets. The front and back covers are made from hard plastic, and there’s a fabric guard over the spine to prevent it from snagging on other binders or your clothes. You can easily tear out the perforated pages, and the notebook features a pen loop on the outside so you’re never without a writing implement. It even has two expanding pocket folders and five movable dividers. Numerous reviewers say this five-subject notebook is “perfect for college” since it’s durable and versatile. You’ll need a backpack to put your notebook in, so check out our guide to the best backpacks for college, too. Leather notebooks are quite sophisticated and impressively durable, so it’s no surprise people love this Leather Travel Journal. It’s made from 100% leather and measures 8.5" x 4". There are 90 double-sided lined pages inside the journal, and what’s unique is you can buy page refills and continue using the same cover for years to come! There are even blank, dotted, graph, and planner inserts available. Happy users say this leather notebook is ideal for work, school or travel writing, and many like that you can use fountain pens on it. (Don’t miss our reviews of the best fountain pens you can buy!) The notebook includes a durable strap to hold it shut, and it comes in several sizes to suit your needs. If you typically end up with ripped, torn notebook covers after just a few months, it may be time to upgrade to a hardcover notebook, which can withstand much more manhandling. One highly rated option is the Lemome Thick Classic Notebook with Pen Loop, a durable product with lots of pages! This hardcover notebook measures 8.5" x 5.7" and includes faux leather covers on both the front and back. There are an impressive 180 pages, and the unique spine allows this notebook to lie flat as you’re writing—plus, it includes a pen loop. There’s a tight elastic band to hold it shut when not in use, and you can store notes, business cards, and other items in the expandable pocket inside. According to reviewers, this notebook exceeds expectations with its high-quality paper, abundant pages, and durability. What more could you really ask for? For a weatherproof, pocket-sized notepad that you can take anywhere, we recommend the Rite in the Rain Top-Spiral Notebook. Its pages are truly waterproof, making it ideal for anyone who might find themselves jotting notes or writing outside. This pocket-sized notebook is 3" x 5" and contains 50 sheets of all-weather paper that repel water, sweat, and dirt. You have to use a standard pencil or all-weather pen to write in it, as water-based ink won’t stick, but reviewers say it’s ideal for those in the military, law enforcement, or other professions that force you to be outside during bad weather! Looking for a notebook that encourages more self-reflection? Check out our favorite self-journals available for purchase.